L’applicazione della Carta dei Diritti Fondamentali dell’Unione Europa (CDF) in materia di giustizia penale: valore aggiunto alla CEDU? Since the coming into force of the Lisbon Treaty the EU Charter of Fundamental Rights (CFR) became a binding source of law, both for the EU institutions as for the Member States, when they apply EU law. The CDF was elaborated as a codification of the existing body of law (mostly caselaw of the European Court of Human Rights and of the European Court of Justice). The question thus does arise to the added value of the CDF, compared to the ECHR, especially in the area of criminal justice. Will the ECJ give an extra dimension to the protection of human rights in the criminal justice dimension of the Area of Freedom, Security and Justice, based on the CFR? Will Charter right as the one to fair trial and ne bis in idem be interpreted in a way that their reach will go beyond the equivalent rights of the ECHR? Equally relevant is the question of EU human rights standards, laid down in legislative harmonisation or in case-law harmonisation, based on the CFR, are always minimum standards for the Member States. Cesare Beccaria – whose most celebrated book “Dei delitti e delle pene” was published 250 years ago – is unanimously considered one of the founding fathers of Modern Criminal Law. Such a reputation is the consequence, among others, of his fight against the death penalty and any other form of inhuman or cruel treatment. Nevertheless, Beccaria in his famous booklet, declares to be in favour of life imprisonment, considering such a penalty as being particular effective, due to its intimidation and deterrence effects. Most of the legal scholars have considered this position to be either irrelevant, for it is only concerned with the research of a legal substitute to the death penalty, or commendable, for it is in contradiction with the notion of humanity Beccaria declares to inspire himself. This paper, following the analysis of Michel Foucault, suggests a different interpretation: life imprisonment is neither irrelevant nor contradictory in Beccaria, but is the consequence of the rationale of punishment in the XVIII century when utilitarianism had a prominent role. In that time the concept of humanity was irrespective of the single individuals and it was only conceived as a limit to the exercise of power. 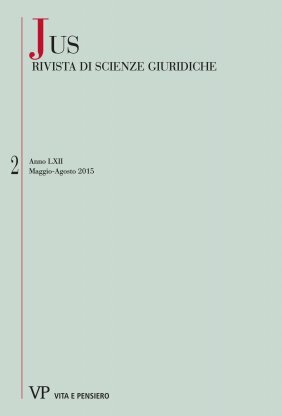 The study examines the legal effects of the codes of ethics of italian universities after Gelmini reform and, subsequently, after the anti corruption law of 2012. The analysis of italian legislation shows that codes of ethics of universities cannot be considered as specific codes of conduct disciplined by general law of public employment. The second part of the study examines the wideness of autonomy of universities according to the discipline of codes of ethics of Gelmini reform and if this kind of autonomy can increase differentiation, efficiency and accountability of university system. The essay is inspired by a research project about the concept of rationality in law/rationality and law, and deals with how criminal law forces itself to contain drifts of irrationality as in committing crime as in imposing punishment. By a ‘genealogic’ approach, the author analyzes the circumstances under which the rationality principle is appeared in the controversial history of criminal law, and observes two main areas whereas the clash rationality/irrationality became hardier. First, much of the criminal law is characterized by the conflict between formalistic and antiformalistic perspective, that is by the question how space is to be accorded to judicial power in the production of the criminal rules. Second, the law enforcement raises the problem about how many and which are the real goals of the punishment, and if the punishment is really able to achieve these goals, in according to a instrumental vision of the penal sanction like a way to fulfil social aims. This article discusses the problematic features of legislative and judicial deliberation regarding the current compliance to the civil law principle of the ‘statutory reserve’. Many extraneous considerations, economic too, often enter in, and certain inherent features of these bodies make them especially problematic. Probably, the criminal law fate is to accept that its instrumental rationality is bounded, and it’s important for the legislator and the judge acknowledge these imperfections, and they adopt a results orientation instilled by the humility of ignorance, due to serious effect for the life of the persons involved in the criminal justice system decisions.